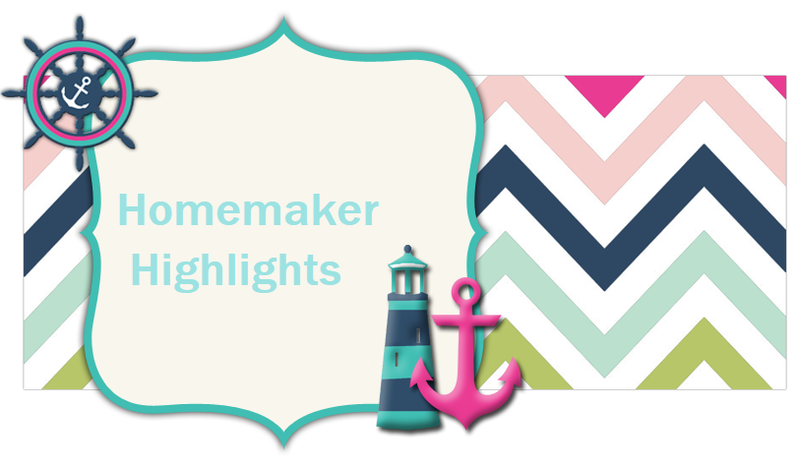 Homemaker Highlights: Vintage 50's Inspired Kitchen for less than 50.00!! 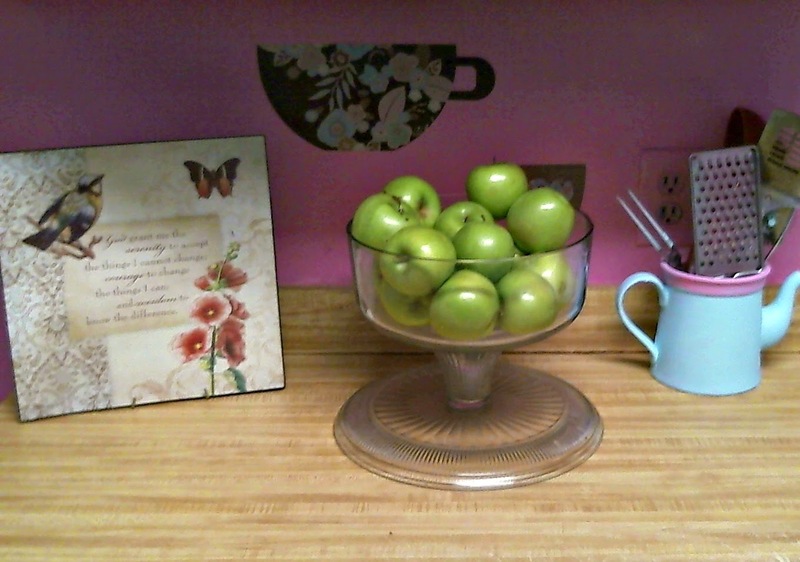 Vintage 50's Inspired Kitchen for less than 50.00!! 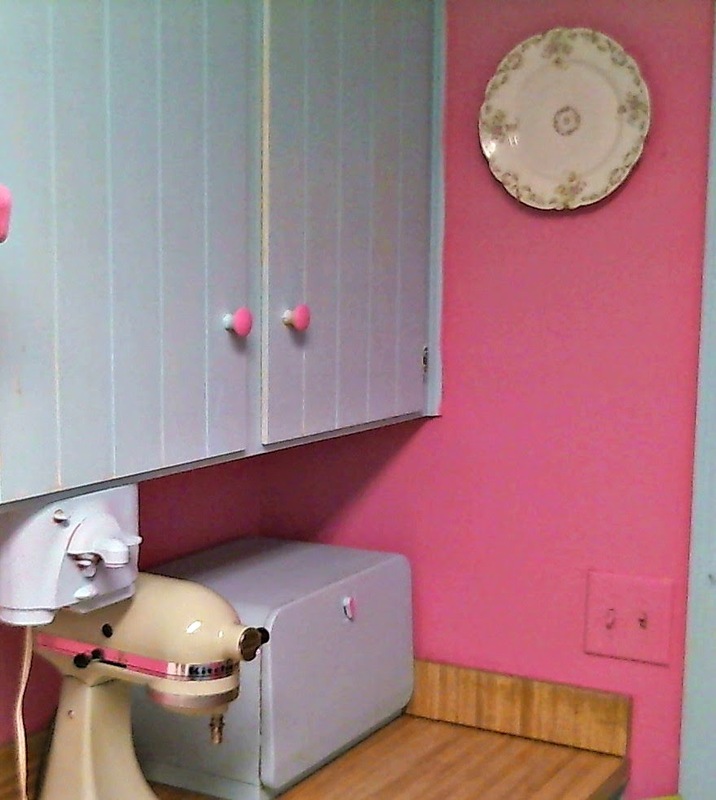 I thought I would take you on a tour of my new frugally decorated, vintage 50's inspired, kitchen! Recently, I repainted and decorated the girls' room. In the end I had some left over paint and thought I I would paint the kitchen. It took me a couple of days to rip off most of the wallpaper and some areas I actually had to paint over (which turned out better than expected and I found a lot of pointers on Youtube). Since their paint was a little too bright for my taste I took a bit of white and mixed with their pink paint. 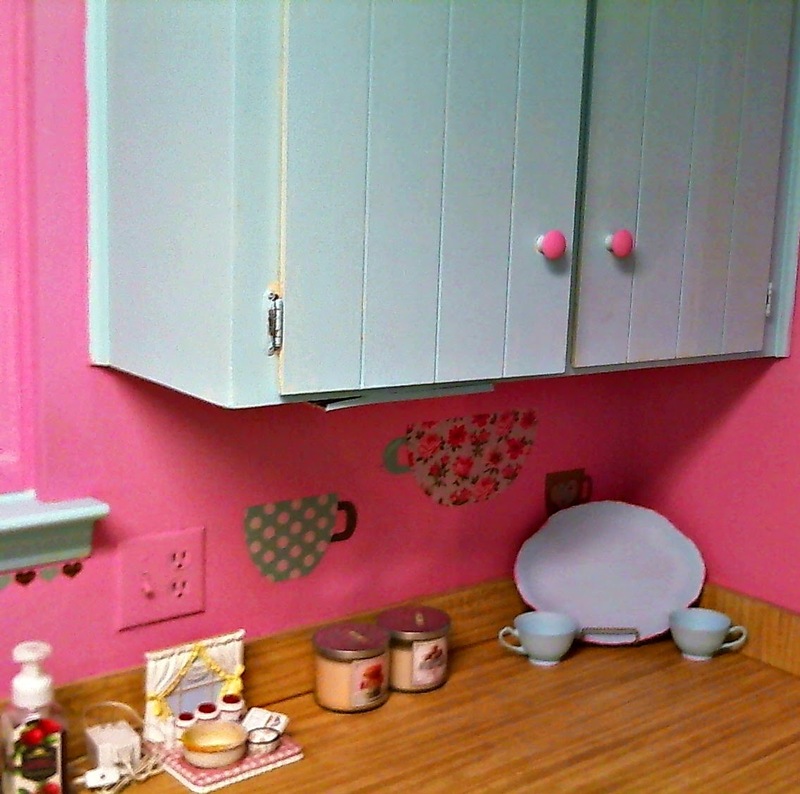 The outcome was a rich and pretty vibrant pink that was perfect for our tiny kitchen. 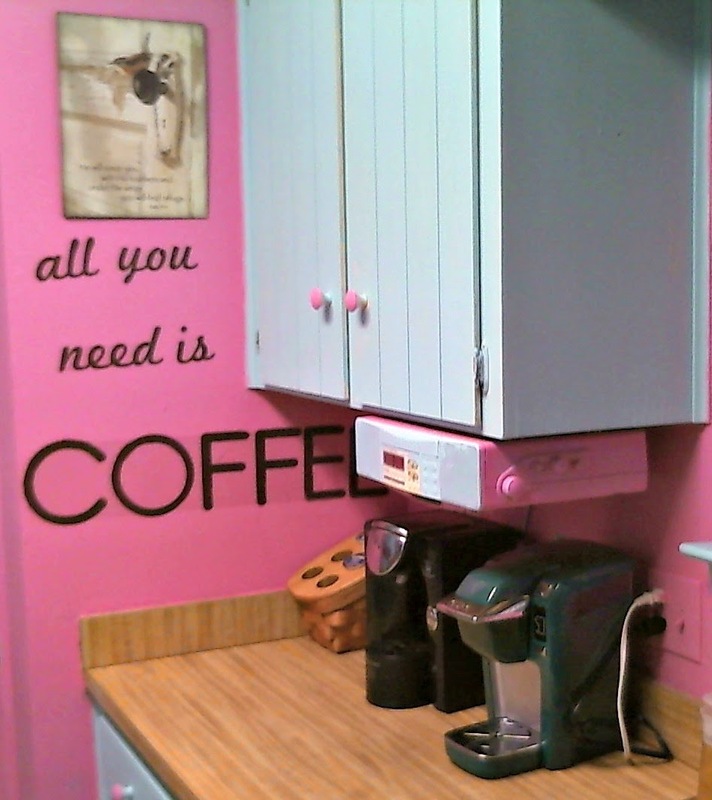 I have to say that since the makeover I find the kitchen a very cheerful and encouraging place to be. Right now it has to be my absolute favorite room of the house. So, let's get started with the tour! Here's the first corner of our kitchen. My inspiration was actually that cute wax warmer to the left (I purchased from www.scentedbaskets.com and I believe she has a clearance going on at the moment). It's my favorite wax warmer in our home and I love the 50's look it provides. The plate and tea cups were found at a local thrift store for well under a 1.00 (I painted those with the trim paint). 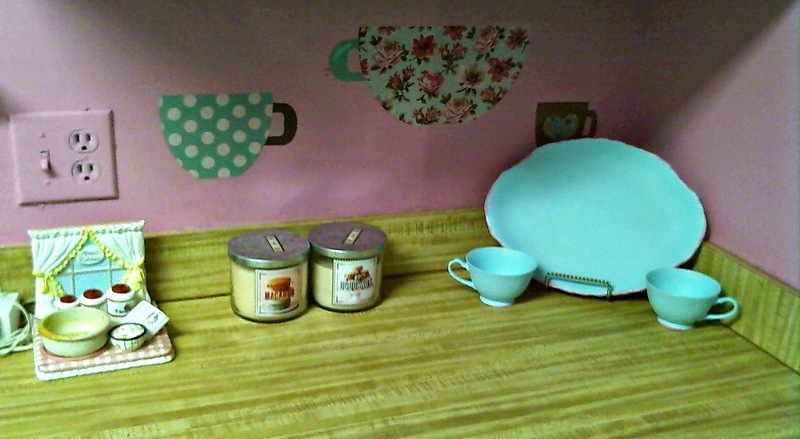 The tea cup decals are from the clearance aisle at Target for 3.00. I purchased 2 packs and had plenty to decorate the kitchen. That's the great part of owning small spaces, the cost of redecorating and time to do so are minimal. This is my window ledge looking out into the back yard. Again, I have more decals and found these cute Ramekins at Tuesday morning, I believe, they were 4 for a 1.00. This is the coffee station I set up. I even painted the little radio Barry and I have had for about 13 years now. I added a little scripture for encouragement in the mornings. The K cup basket I won from Petersboro last year. You may be wondering why I have two machines? 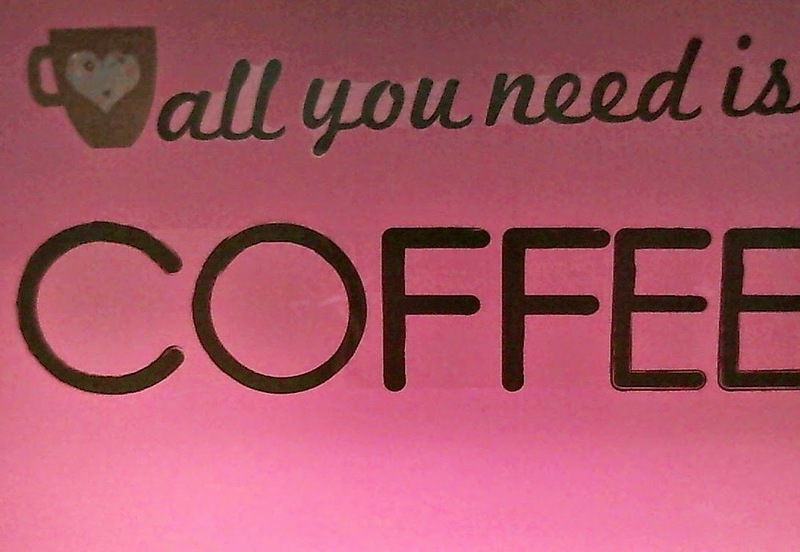 How much coffee can one girl drink..lol. I actually won the Tassimo machine last year and still have cups for it. The Keurig was a 13th wedding anniversary gift Barry got for me. So we use the Tassimo for harder to find beverages (I.E. Cadbury hot chocolate, Twinings teas, etc.) and the Keurig for their great selection on different beverages. 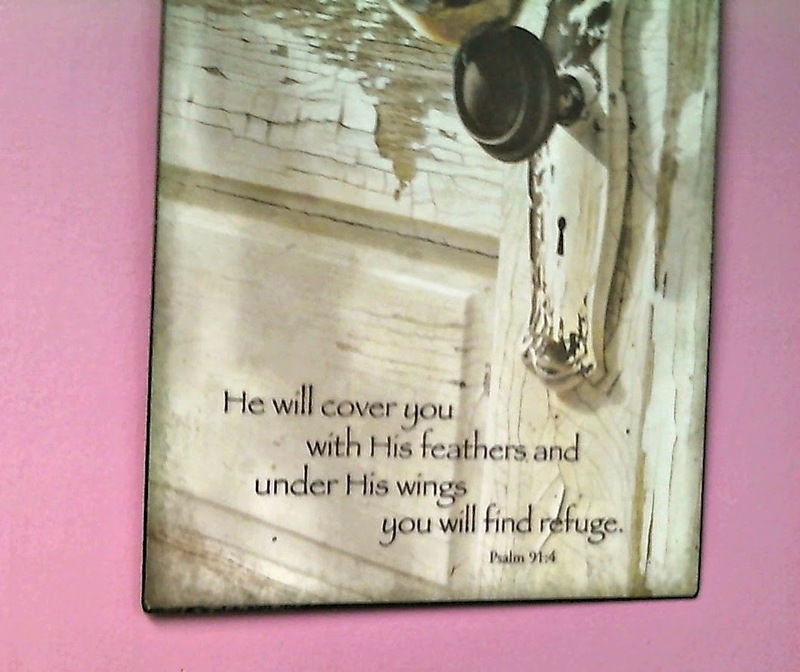 Here's a better look at the scripture I have hanging up. I bought this on clearance at Kirkland's a couple of years ago for around 2.00 and love that it's tin. This is an area next our stove. I decided to display more functional pieces we use daily. Another scripture tin for encouragement from Kirkland's, our fruit bowl, and all our cooking items for easy reach. This was actually a tea pot I bought for about a 1.00 at a thrift store and it was in the blue willow design. I just painted it with the trim paint and wall paint. The decals are from the same Target pack. This is a decal above our stove and out of the same pack of decals I purchased at Target. This is our bread making and baking corner. 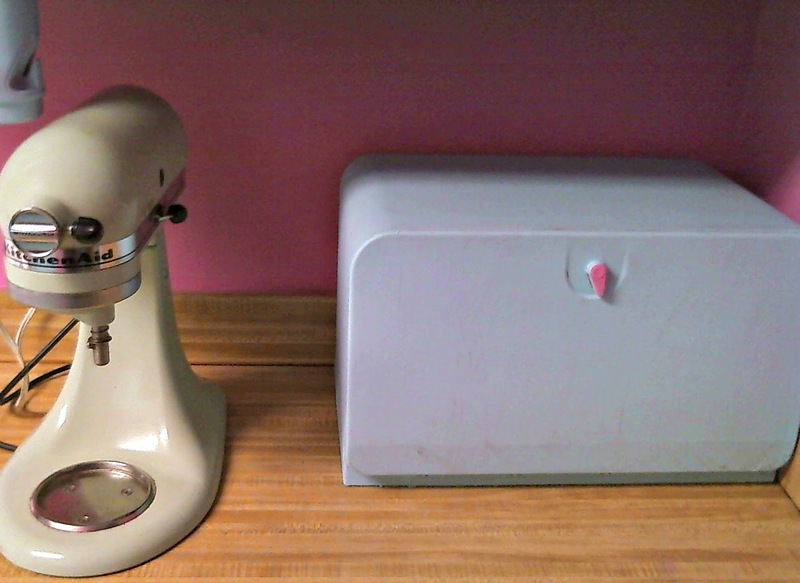 I put my mixer there (I love the color) and a bread box I purchased a yard sale years ago. I just painted with the trim paint and painted the latch with the wall paint. Another look of the bread making and baking corner, but at a different angle. If you are like me and have a small pantry, here is a really neat idea. 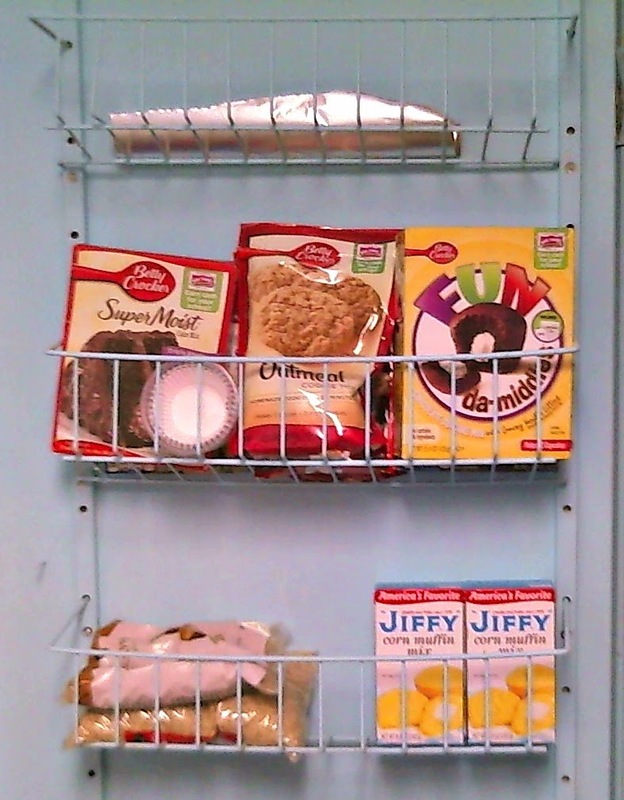 You can buy a shelving unit to attach to the back of your pantry door to maximize that space and it's adjustable. Fortunately, for us this was already assembled and here when we bought our home ten years ago, but I just updated it with a little paint. If anyone asks, this is my "Shabby chic" look pantry..lol. I didn't have time for the second coat of paint and will do that soon. For better organization I bought these adorable bins at the dollar tree. It's so much easier having like items divided up Vs. randomly sitting on the shelf. 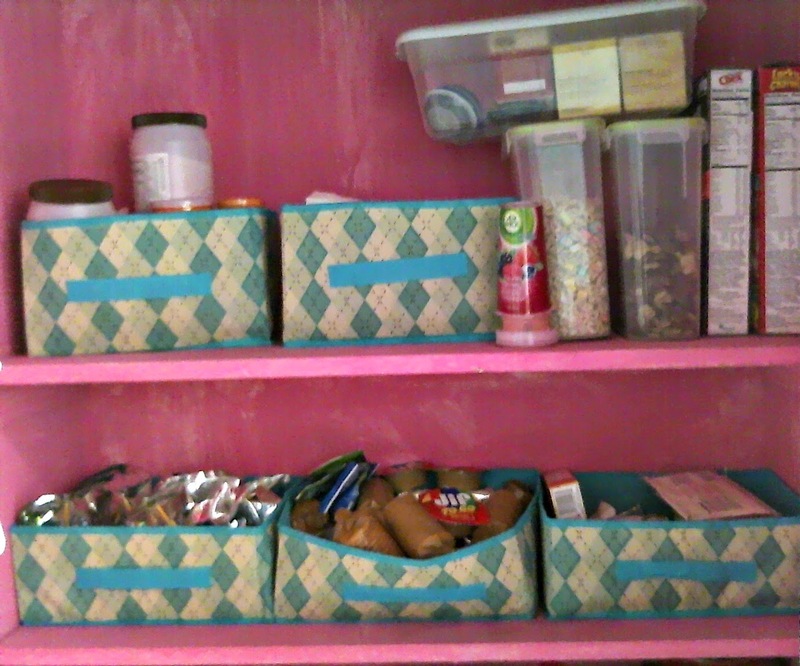 I used one bin to house juice boxes and another to house school snacks. It's easy peasy now for the girls to grab the bins and pick out their daily snacks in the morning. Just another angle of the kitchen and you can see the paint color just a bit better in this photo. I hope you guys enjoyed my tour of my tiny 50's inspired vintage kitchen. All together it cost less than 50.00 to give our kitchen a new makeover!!! Tomorrow I will post about how we gave our bathroom a frugal makeover and it's adorable, guys. Think owls!